It’s easy to create your first geocache and all you need can be found in your local Canadian Tire shop. In this article, I’ll concentrate on a bigger cache container. If you’re looking for nano or micro containers, visit Bison Designs. Lock & Lock 3.9 L Rectangular Container – http://www.canadiantire.ca/en/pdp/lock-lock-3-9-l-rectangular-container-1425201p.html#srp in Kitchen Food Storage & Wraps Food Containers. This is a 100% airtight and liquid tight waterproof plastic container that is one of the best choices you can make for your geocache, don’t go for cheap substitutes from Ebay. Another good choice is a Clearlock Plastic container, you can buy 3 pieces for $19.99. I’ve tested them personally and even though they only say they are airtight, they are liquid tight as well. Here is the link: http://www.canadiantire.ca/en/pdp/clearlock-plastic-container-set-6-pc-1425078p.html#srp and you’ll find it in Kitchen Food Storage & Wraps and Food / Containers section. This way you pay less and end up with 3 geocaches. 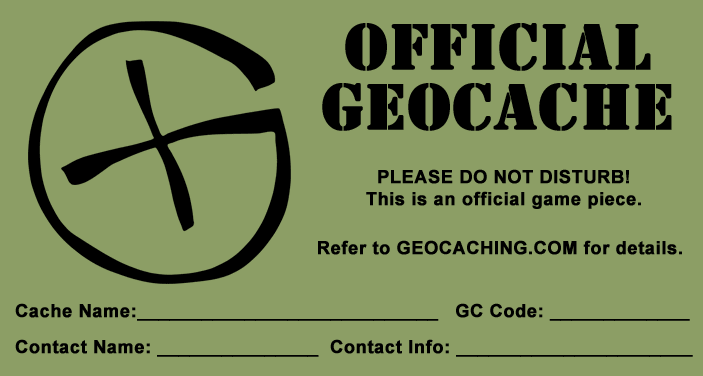 Now we need to clearly identify our cache as a geocache, the best thing is to mark the cache container with the words “Official Geocache,” the name of the cache, and appropriate contact information. Five Star Fat Coil Book – http://www.canadiantire.ca/en/pdp/five-star-fat-coil-book-1424158p.html#srp in Household & Pets Office Supplies Notebooks & Pads. Include a note to welcome the cache finder. The note, available here, has been translated into several languages and explains the activity in case someone accidentally finds your cache. Lastly, you can put items of your choice into the cache, which is recommended, but not necessary. What you place into your cache is up to you, budget permitting. People of all ages hide and seek caches, so think carefully before placing an item into a cache. Explosives, ammunition, knives, drugs and alcohol should not be placed in a cache. Respect the local laws. Note that food items are always a bad idea. Animals have better noses than humans, and in some cases caches have been chewed through and destroyed because of food items in a cache. Please do not put food in a cache.